Last week, ICY team members Sean Barton and Justin Green led two free workshops—one at the Westport Boys & Girls Club and one at the McElderry Park Community Center. Justin led the participants through a thorough history of western lettering, from the Roman era to present day, while Sean brushed out examples of each style. Shortly before the Fly Paper Incident, Justin reviews student work. 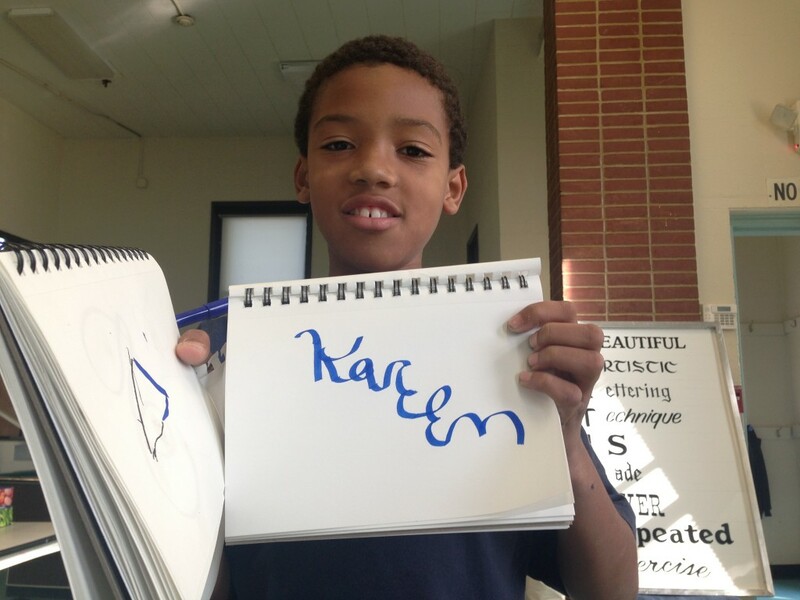 The younger kids at the Boys & Girls Club were particularly impressive students—they were rapt with attention throughout the entire lecture, and did some beautiful work. 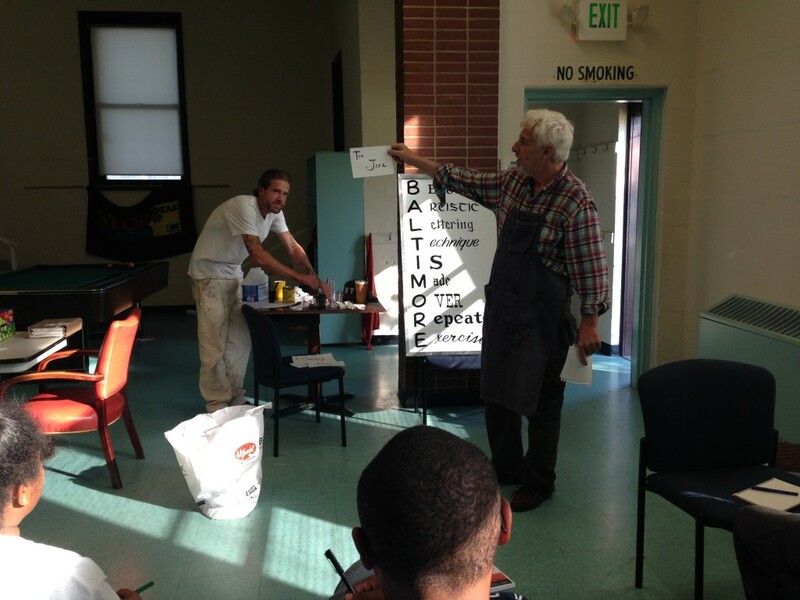 We were also able to leave our “Lettering Guide”—tailored to Baltimore—at the Westport Rec Center to remind the kids about the different alphabets they worked on. 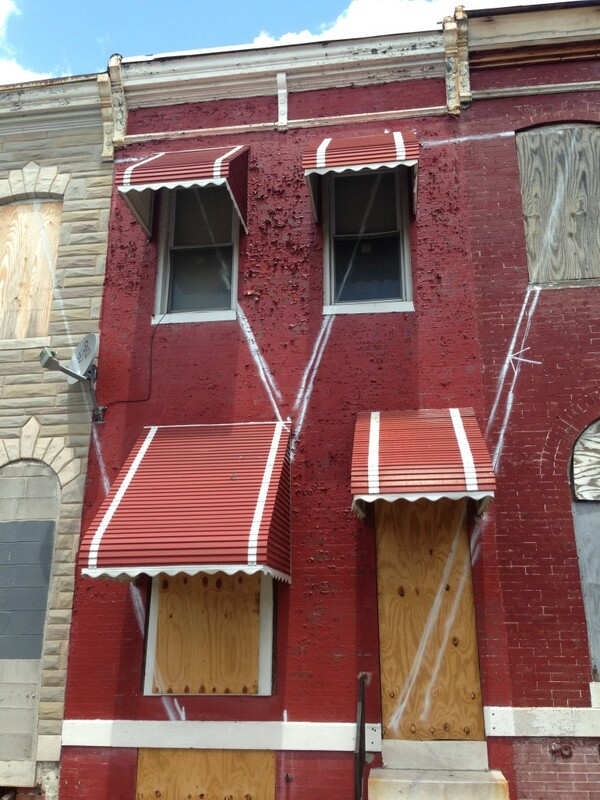 In the meantime, work continues at sites around the city. But each wall deserves its own post, so stay tuned. 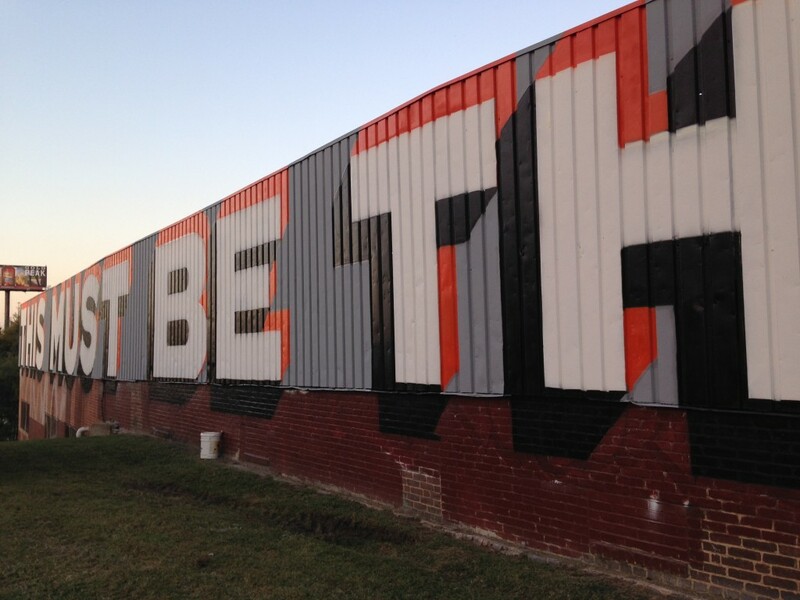 Golden hour along 295—nice time to be done with wall one. David Byrne said it first, and now we’re saying it a little louder. If you look at the phrase from the right angle, it lines up perfectly with the “BALTIMORE” smoke stack—keep your eyes peeled on 295. Or on Instagram—Steve photographed it from the side of the highway so you don’t have to. Thanks Sean Barton, Mike Levy, Andy Dolan, Maggie Villegas and Lynne Kirsner! Come for the free signs, stay for the avocado. 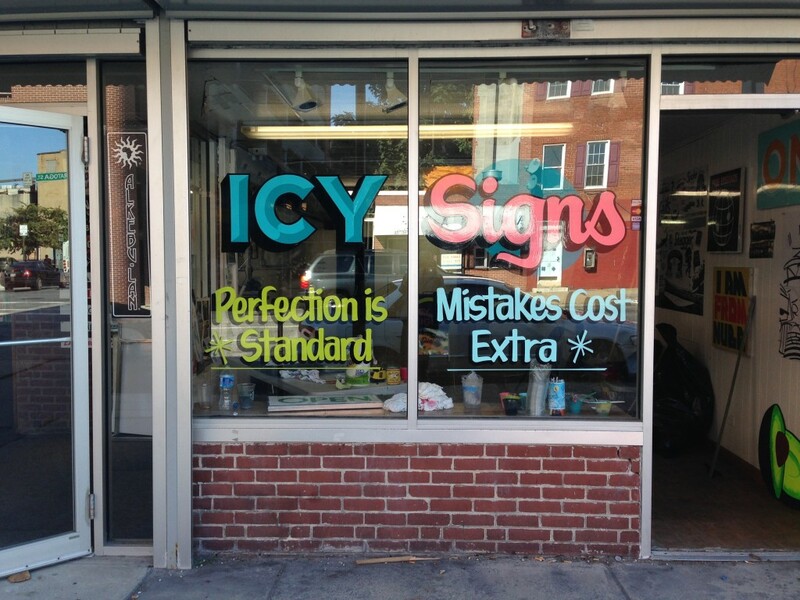 Steve Powers & the ICY SIGNS team have arrived and they’re setting up shop now at 224 N Paca St in Lexington Market. 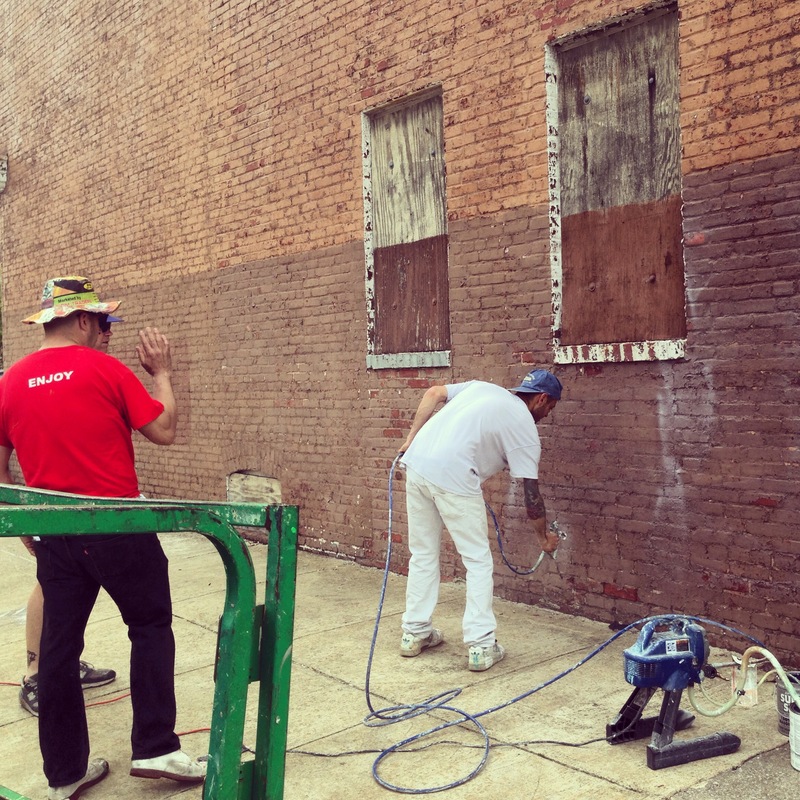 In addition to using the sign shop as a staging area for their cross-city mural project, they’ll be making free hand-painted signs for Baltimore businesses starting this week. In need of a sign? email icybaltimore@gmail.com. 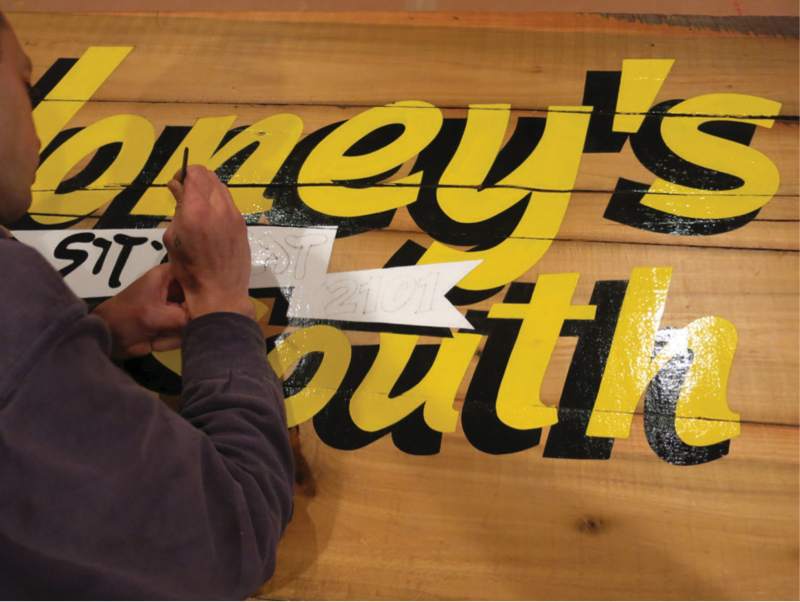 Custom signs take time, so make sure to get your request in early! The first time I met Steve Powers, he climbed out of the big white BOPA family van sporting a yellow raincoat and a Guided by Voices T shirt. 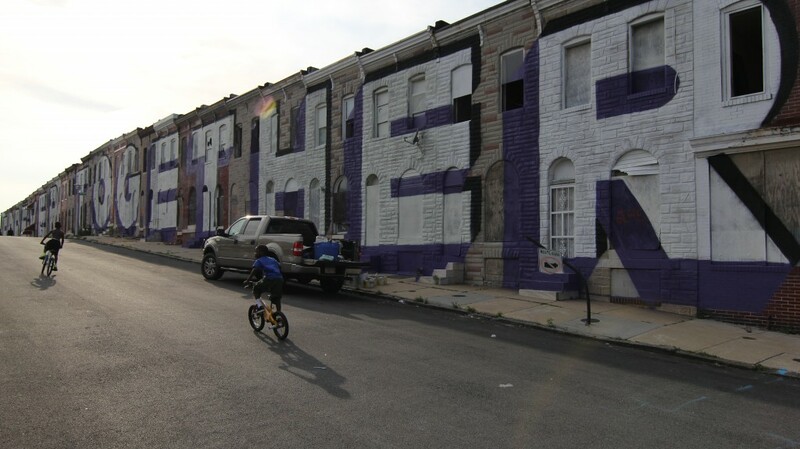 The world-renowned Philly-born graff-writer-turned-Fulbright-scholar was in town for a marathon of cross-city site visits and community meetings for our upcoming Love Letter to Baltimore project this fall. (Haven’t heard much about it yet? That’s because we’re still planning it!) 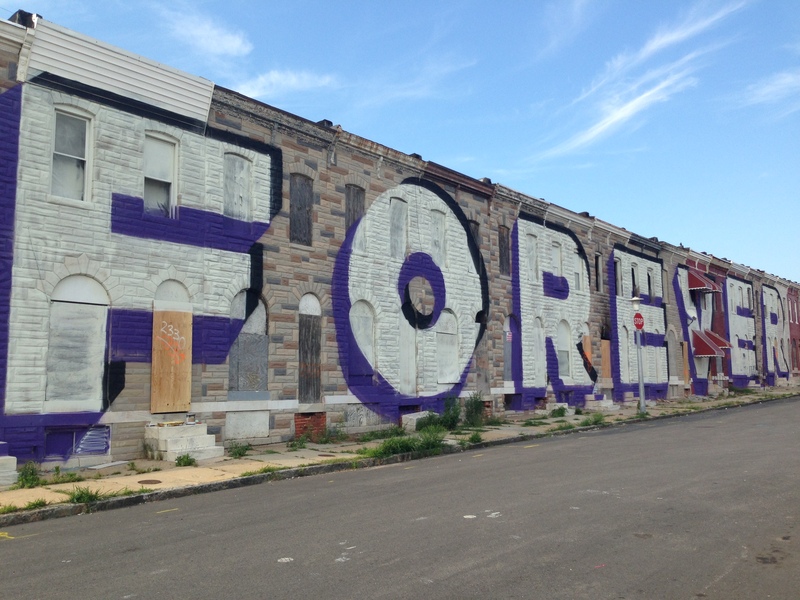 When Housing offered up the wall space for what Steve called a “temporary forever” mural, he tacked that onto his trip. I showed him the lift and pointed out the wall at 2454 E. Eager Street—the corner house in a row of city-owned vacants slated to be demolished later this summer. 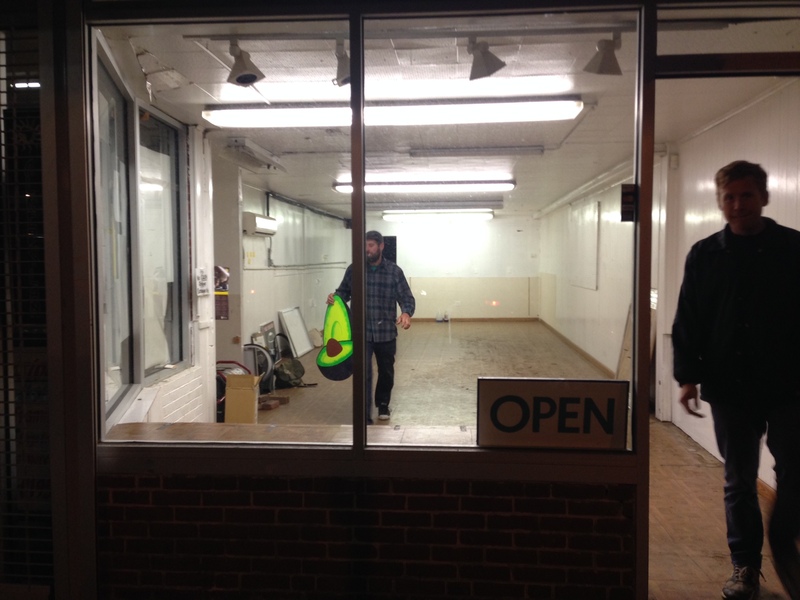 He quickly walked passed it and all the way down Eager Street. The yellow raincoat floating behind him made him look like a mad scientist. When he came back he asked if they were all vacant. I said they were, that we had just planned on the wall at 2454, but we could ask about the rest. Less than 24 hours later we were signing a right of entry agreement for 35 properties; Steve ordered 10 gallons of “Ravens Purple” and a power generator for his paint sprayer and got to work. Not on painting, but on talking to the people who live next door—on Montford, on Eager, on Port—about what they love and what they hate about their city. 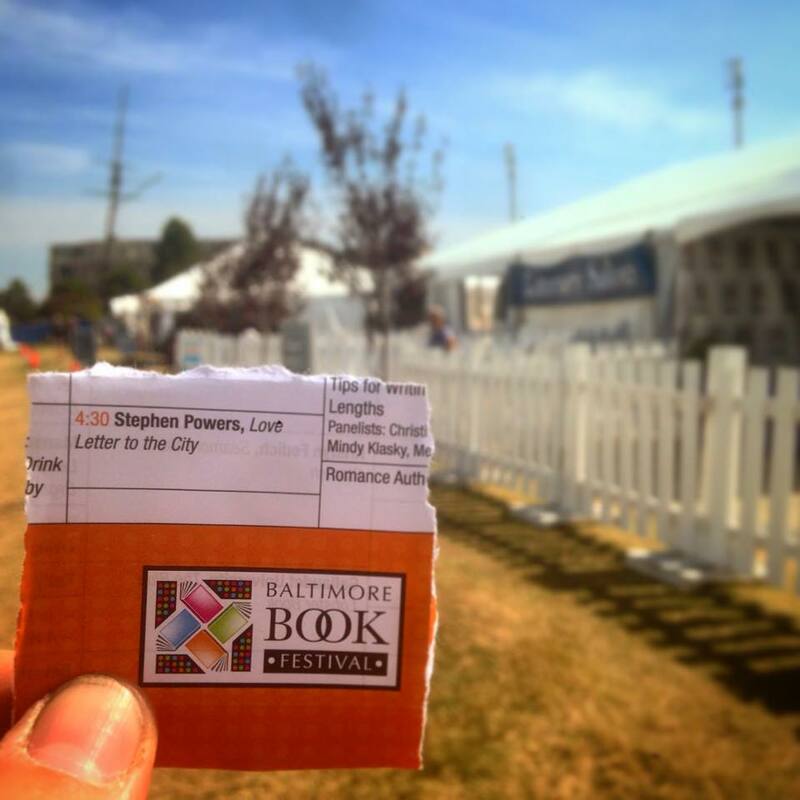 So began the first line of Steve ESPO Powers’s Love Letter to Baltimore: FOREVER TOGETHER / I AM HERE BECAUSE ITS HOME. 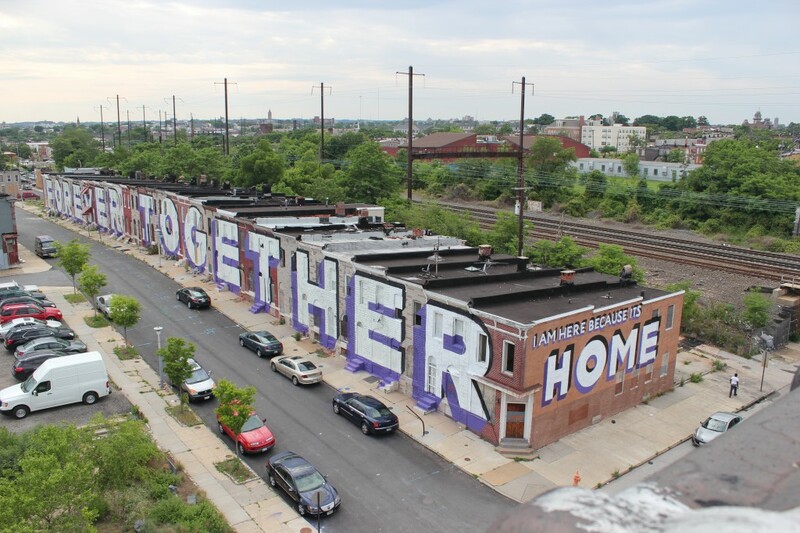 “Temporary is permanent and together can be forever” – Steve Powers on his temporary mural which spans from 2402-2454 E. Eager St.